Facial flaps can be divided into two types: Axial and Random. An axial flap has a named artery supplying it. The surviving length of an axial flap will remain constant regardless of the width of the flap. A random flap has smaller unnamed vessels and is not as stable. It’s surviving length is in direct proportion to the width. A random flap’s surviving length can be lengthened by “delaying” the flap. To delay a flap, it is elevated but left in position as a bipedicle flap. Two weeks later it is raised as a unipedicle flap and placed into position to close the defect. Interpolation flaps traverse skin in order to reach the defect. If placed over the skin, they will have a pedicle. The pedicle can be divided in 3 to 6 weeks depending upon the type of flap and the condition of the patient. Flaps may be “trained” by occluding the blood supply in the pedicle for progressive lengths of time. This allows for an earlier transection of the pedicle. Care of the flap during surgery should include, not grasping the skin with forceps but instead using skin hooks attached to the underlying fibrous tissue to move the flap in position. Post-op care should include the use of antibiotic ointment three times a day. The flap may get wet after 24 hours after the wound seals. The patient should be followed closely and if the flap starts to die, sutures should be released to relieve flap tension and improve flap blood supply. Forehead Flap This is a commonly used flap with a good blood supply. The end cosmetic result is usually good. The biggest disadvantage is that two operations are required and the patient must live for several weeks with a flap pedicle over his face. The blood supply to the forehead flap is by the supraorbital and supratrochlear artery, both are branches of the opthalmic artery and are of the internal carotid artery system. This flap may have a very large length to width ratio. The surgeon must be careful not to create a defect which is too wide and prevents closure of the forehead donor site. Flaps wider than 2.5 cm will often create donor sites which cannot be closed primarily. Abbe Estlander Flap This flap also has a named artery and an excellent blood supply. The pedicle of the flap is very small. The biggest disadvantage is that two operations are required and the patient must have his lips sewn together for 4 to 6 weeks. The blood supply to this flap is from the superior labial or inferior labial artery, both are branches of the facial artery and are of the external carotid artery system. Rotation Advancement Flap This flap can be used to close large and small defects. As a general rule the length of the flap’s arc should be twice the width of the flap’s base. It is often used on the scalp where there tissues have little stretch and a large flap is required to close even a relatively small defect. Rhomboid Flap This flap is easy to construct and rotate into position. 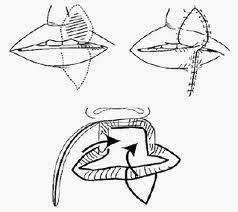 Bilobed Flap This flap is a combination between a rotation advancement and nasal labial flap. The flap is comprised of two lobes, each positioned at an angle of 45 to 60 degrees, which are rotated to fill corresponding defects. Each lobe is slightly smaller than the defect it fills. The prominent “dog ear” and distortion of the nostrils, which can occur with a nasal labial flap are less likely to occur with a bilobed flap. The bilobed flap is useful in reconstructing nasal alar defects of 1.5 cm or less. Keeping the angle of the lobes at 45 degrees minimizes tissue protrusions. The final lobe should be positioned on the border of the facial aesthetic subunit, between the nose and the cheek. Nasolabial Flap This flap is difficult to achieve a good cosmetic result in a single stage. Due to both swelling and the thickness of the flap most patients will require a second-stage reduction rhinoplasty. With wide flaps the closure of the secondary defect can also distort the nose. With superiorly based flaps, the defect is next to the nasal ala and closure under tension may spread the nasal opening laterally. With inferiorly based flaps, the defect is superiorly, and this can result is notching or wrinkling of the nasal ala as the superior nasal skin is pulled laterally. Indications for use of this flap is the loss of the nasal rim, loss of the nasal supporting cartilages (only nasal mucosa lines the depths of the resection), and a through and through defect. If the resection is not deep, a skin graft, if possible a full thickness graft, may be the better option since nasal distortion and flap swelling are then avoided. Full thickness skin grafts give a better cosmetic result than a nasal labial flap but should only be used for small superficial defects. 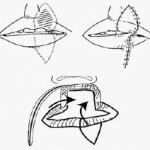 This entry was posted in Cosmetic Dentistry, Oral Surgery and tagged Abbe Estlander Flap, axial flap, bilobed flap, bipedicle flap, flap blood supply, flap tension, flaps for facial reconstruction, forehead flap, random flap, rhomboid flap, rotation advancement flap on June 14, 2012 by chzechze.